A new book from Bruce Schneier - the man who coined the term security theatre that has since made it's way into the mainstream lexicon. In short - Liars & Outliers is good - really good. Schneier comes from a computer security background, but he has gone much bigger picture with this book. Fundamentally it's a book about trust - why we trust each other, what mechanisms we have in society to ensure that we do trust each other, and how these fail sometimes. It's a book that introduces a new framework - paradigm even - for thinking about why we trust each other and what security measures we want or need in our society. Bruce's arch enemy Kip Hawley of the TSA even recommends this book. www.schneier.com is one of the top three blogs I read on a daily basis. 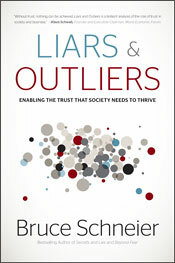 Here's how he describes the big idea of Liars and Outliers. My big idea is a big question. Every cooperative system contains parasites. How do we ensure that society's parasites don't destroy society's systems? Get yourself a copy, it really is excellent.